22 Inch Chrome Wheels 22x9.5 with tires. 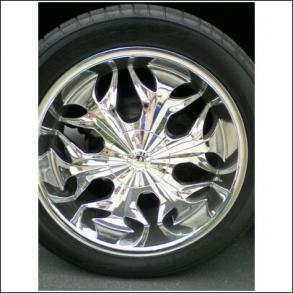 This ad is for 4, 22 Inch Chrome Wheels with 305/40/R22 Sunny SN3980 Tires. These are performance summer tires with 90% tread life left on them. Wheels have been used but are in like new condition with no scratches/damage whatsoever. They were used only for 1 month. These are 6 lug by 5 1/2. They will fit GMC Yukon and Denali and should fit Chevy Suburbans as well. Check to see if your vehicle will fit 6 lug by 5 1/2 wheels to be sure.